Mitochondria are the powerhouses of animal cells responsible for converting the energy in our foods to a chemical—adenosine triphosphate (ATP)—that cells can use to carry out their functions. 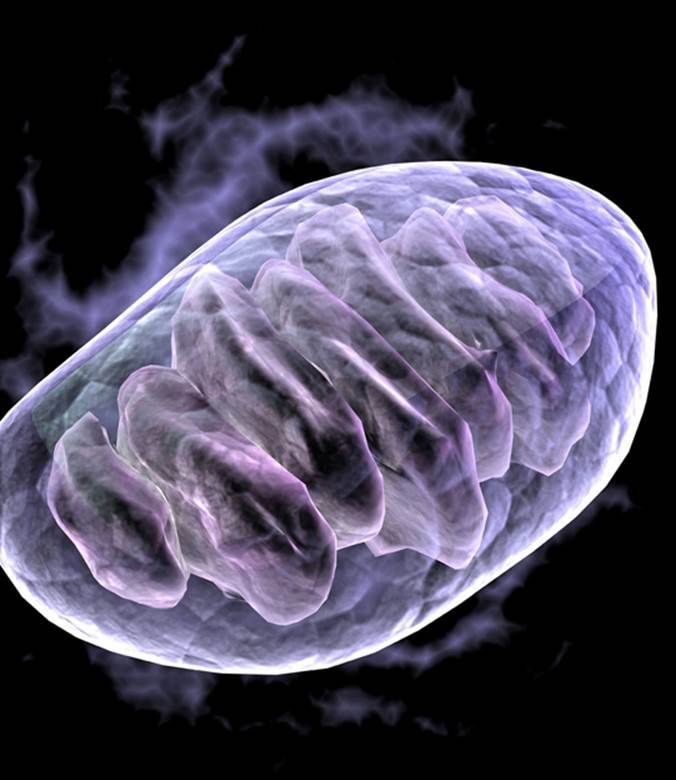 According to the theory of endosymbiosis, several billion years ago mitochondria were free-living organisms that were aerobic (i.e., they used oxygen to produce energy). Large anaerobic (oxygen-lacking) organisms, which were far less efficient in producing energy, engulfed and incorporated the aerobic mitochondria. The process of cellular respiration—whereby sugar, in the presence of oxygen, is broken down to generate a total of about thirty-six molecules of ATP—takes place in three stages. Stage 1 (Glycolysis): In the absence of oxygen, glucose, a six-carbon sugar, is split into two molecules of pyruvate, a three-carbon sugar, and two molecules of ATP. Stage 2 (Citric Acid Cycle): In the presence of oxygen in the mitochondrion, acetate (derived from carbohydrates, fats, and proteins) is broken down to carbon dioxide, water, and two additional ATP molecules. Stage 3 (Electron Transport Chain or Oxidative Phosphorylation): Electrons from hydrogen are carried down the respiratory chain in the mitochondrion, through a sequence of steps, to produce about thirty-two molecules of ATP. During the twentieth century, many eminent researchers sought to understand the sequence of events in cellular respiration. Otto Warburg postulated the presence of an intracellular respiratory enzyme in mitochondria in 1912. In 1925, David Keilin discovered the cytochrome enzymes and the concept of a respiratory chain. Hans Krebs elucidated the citric acid (Krebs) cycle in 1937. Fritz Lipmann, in 1945, uncovered Coenzyme A, an essential component for the metabolism of carbohydrates, fats, and amino acids. Albert Claude separated mitochondria and other organelles using cell fractionation—a process he developed in 1930, permitting biochemical analysis of organelles—and then characterized them using an electron microscope. SEE ALSO: Plant Defenses Against Herbivores (c. 400 Million BCE), Metabolism (1614), Gas Exchange (1789), Photosynthesis (1845), Enzymes (1878), Electron Microscope (1931), Bioenergetics (1957), Energy Balance (1960), Endosymbiont Theory (1967). The mitochondrion is the site of respiration within the cells of plants and animals. Oxygen is used in the breakdown of organic molecules and the synthesis of ATP, which is used to power the chemical reactions of the cell.